In accordance with our policy of "Quality First," we will strive to maintain a business structure, based on ISO 9001, ISO 13485 and other standards, that gains customer trust and enables us to deliver attractive products that meet expectations and needs. In line with our Medium-term Quality Vision 2020, we are working as one to build a globally competitive, leading quality assurance system. 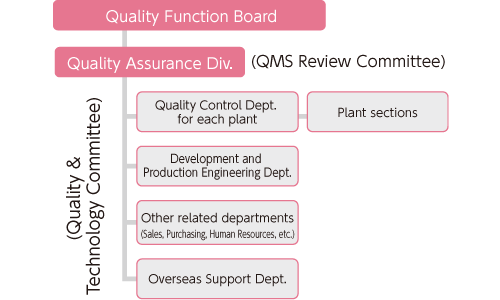 In addition to domestic efforts, head office regularly sends support people to overseas plants to provide training to quality officers at each site and provide appropriate assistance regarding quality issues to strengthen their quality assurance systems. We are always working to improve our level of quality assurance. In addition to ISO 9001 certification, we have also obtained other third-party certifications and public institution accreditations based on our QMS, and we are assessed every one to five years for review of these certifications and accreditations. After the 2015 revision of ISO 9001, we passed the revision approval for Steel products, forged products, and electro-magnetic products. Copyright © AICHI STEEL CORPORATION. All Rights Reserved.